It's go time for our new adventure. We have decided to start on Airport Way and spiral around Georgetown counterclockwise seeking out and eating lunch at every independent spot we come across. Thanks to Google Street View we were able to do some remote reconnaissance before heading out today. Our first loop starts on the outside (east) of Airport Way where Street View shows nothing that might server lunch (Lots of likely spots on the inside. We are looking forward those on our second pass). We turned right on Hardy and still nothing. Nothing too along Albro or Ellis. We finally hit the first possible lunch spot after turning north on Marginal Way. 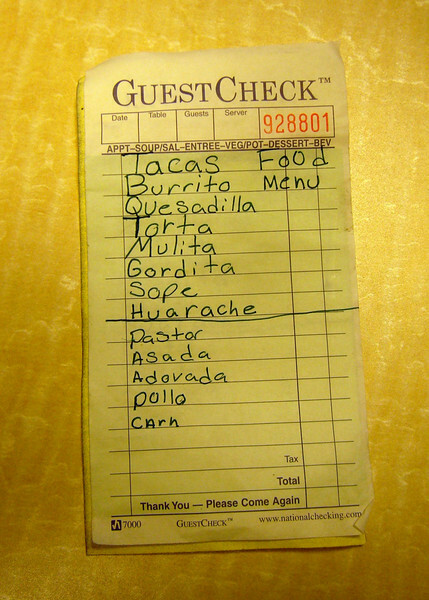 It's a Mexican restaurant, El Gallo d'Oro, about which we can find little online. Armed with this intel we (Emmett, Adam, and Geary) grabbed Dave (not like that) and headed out. We followed the route starting on Airport Way and sure enough there was nothing until El Gallo d'Oro. Upon arriving we found the lot empty and door locked. 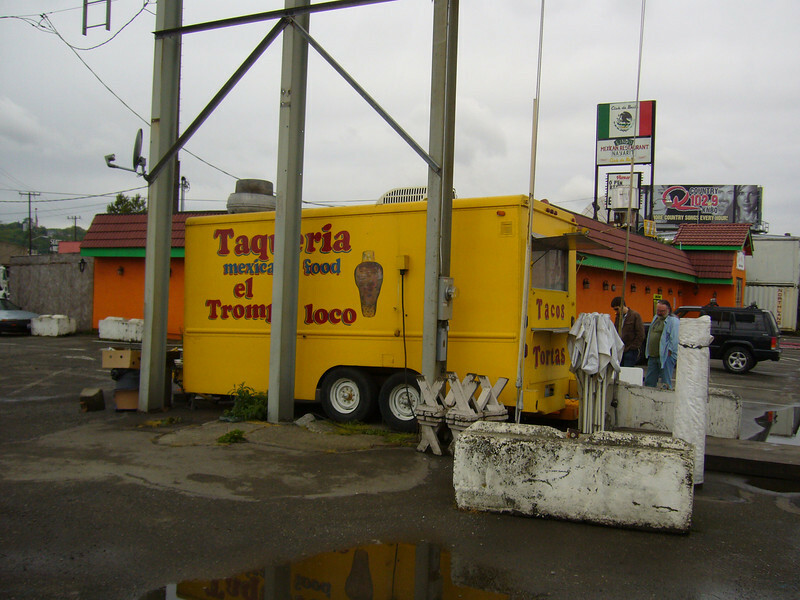 In the derelict lot to the south, however, there was a big yellow taco truck with its name, Taqueria el Trompo Loco, hand painted on the side. It was not clear if it was open either. We asked the woman hosing down mats outside and she said that they were just opening and confirmed that El Gallo d'Oro is no longer serving food and is now just a bar. 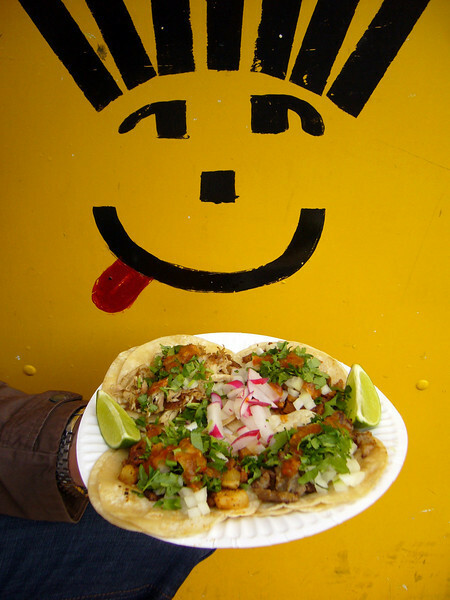 Our Golden Rooster dreams dashed, we sidled up to the taco truck and prepared ourselves for PBR150 lunch #1. Game on. We had already prepared ourselves for Mexican, but were also anticipating a nice frosty one to wash it down with. The disappointment hung heavy as we sized up the taco meat list and put in our orders. Four tacos seemed like a good goal and I went with Pastor (pork), Adovada (pork), Suadero (beef), and Carnitas (I like pork). 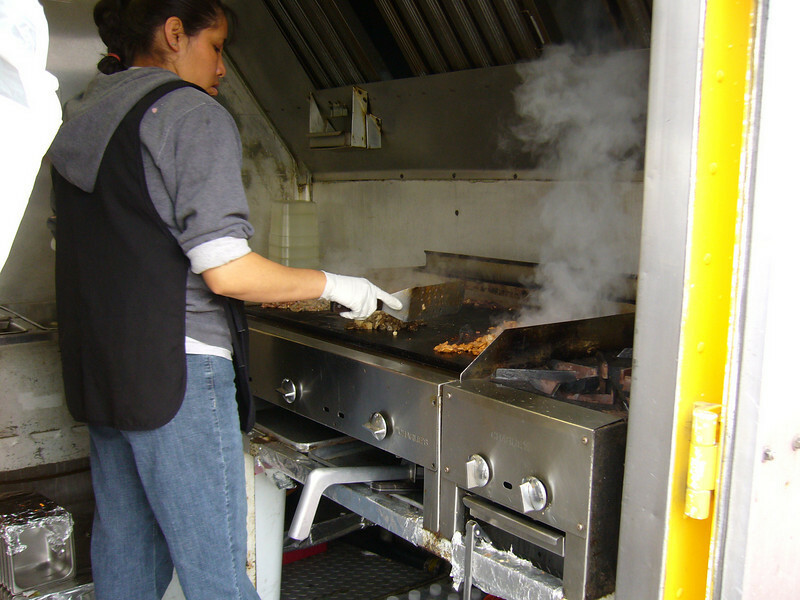 When the grill fired up and the aroma from the cooking meats started wafting from the truck (actually, trailer) we started to forget our disappointment and make ourselves comfortable on the jersey-like barriers adjacent to the taco trailer. As we were waiting we learned that the Taqueria el Trompo Loco is famous around the PNW for their Tacos al Pastor that they cut from a vertical roasting spit (like Greek Giros) on Fridays and Saturdays. 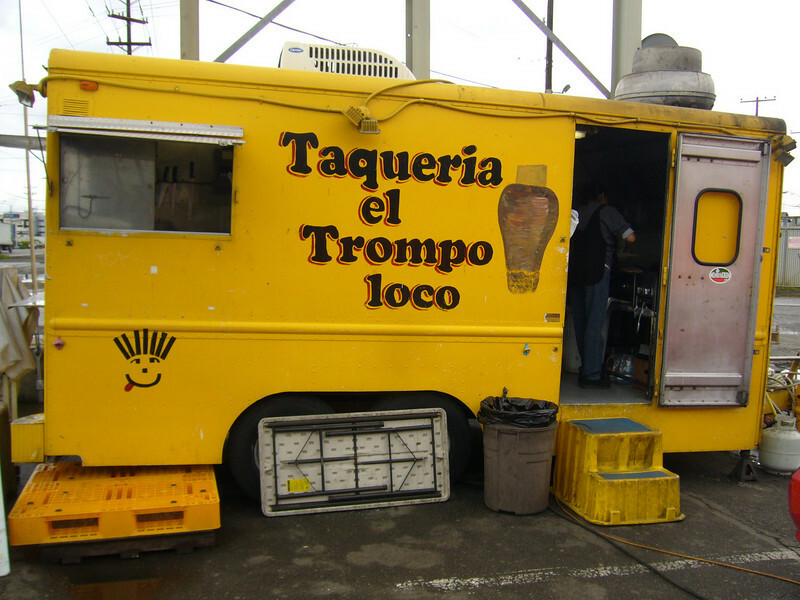 The spit is colloquially called El Trompo, the top, because it resembles the spinning toy. We were told that people come from as far away as Oregon and Idaho. Really? To this dusty parking lot next to the steel plant? We were not convinced. But then the food arrived. When the tacos were finally delivered through the tiny window any previous disappointment vanished. The four tacos almost completely enveloped the paper plate. 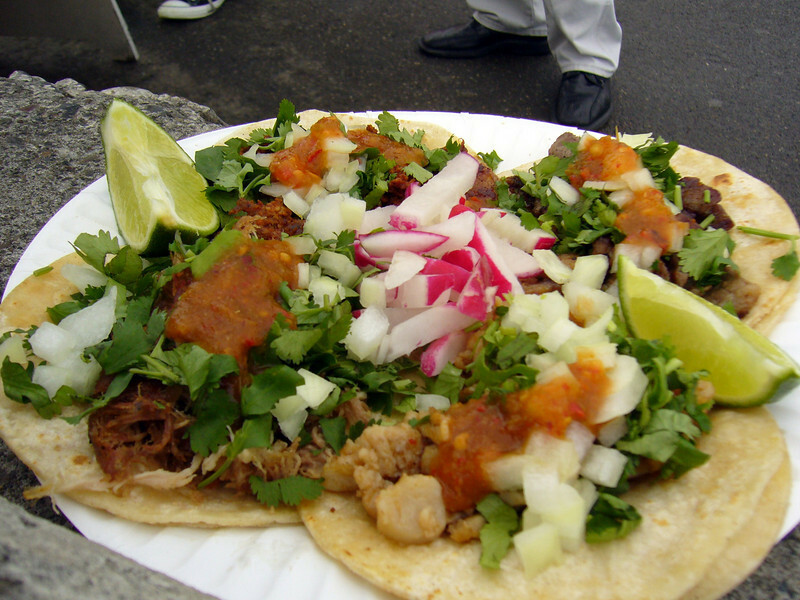 Each taco had a splash of orange salsa and onions, cilantro, and chopped radish piled generously on top. I started with the Suadero since it was new to me. Suadero is apparently grilled beef brisket. It had a nice grilled flavor with crisply bits, but a few bites tasted a bit off, like the meat was approaching its pull date. Not bad enough to put it down mind you. That was the last road bump. The other tacos were excellent. The Carnitas were tender and porky. The Adovada had a nice smooth chili sauce and the Pastor was spicy and full of flavor. The orange colored salsa was the perfect, spicy complement to the meats. While the ambiance was not great, the food was. It was an auspicious kickoff for this new adventure. Still, a beer would have been nice. What could be a better kick-off to this adventure than a Taco Truck? 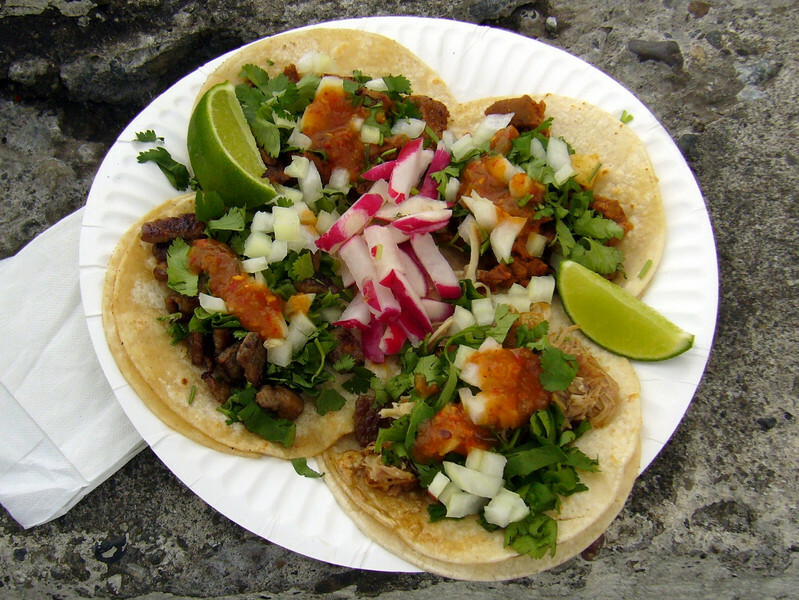 Which brings up a question for me: Why do Taco Trucks never move? They're always in the same place. Is there a legal advantage to being theoretically mobile? Anyways, on with the review! Before ordering, I needed a lesson in what each of these awesome meats were. I'd share my lessons with you here, but it turns out that Wikipedia does a better job than I can. I'm going to list them in their order of awesomeness, but to be fair, they were all light years ahead of the typical Mexican food I eat. All of these tacos were really awesome. And the garnish and hot sauce needs to be mentioned too. The pickled radish wedges were definitely good and a little spicy. The habenero hot sauce was amazing; it was spicy and very flavorful. I even liked it so much that I got a little cup of it to-go to leave in the fridge at work. Maybe it was the excited of the start of the PBR150, maybe it was the theoretically-mobile food station, but probably it was the totally awesome food. This place has earned a place in my heart, and a 4-Rainier rating. 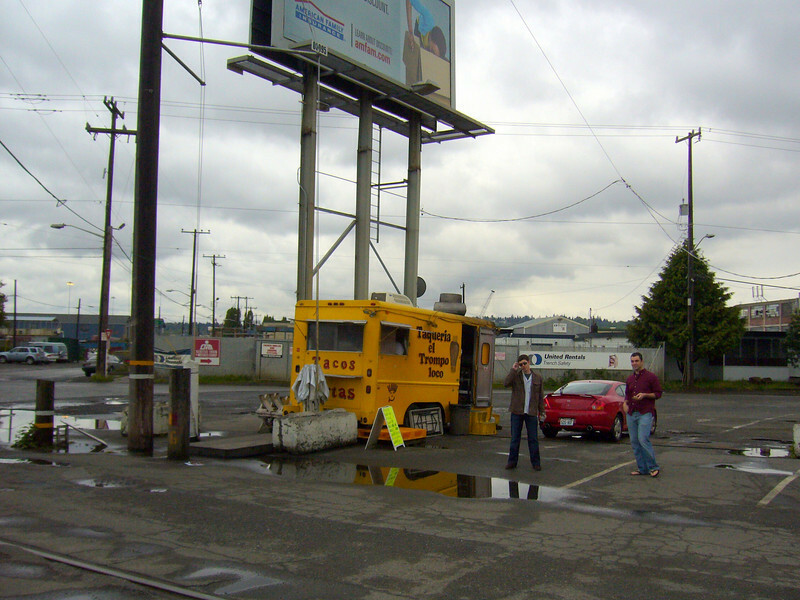 Inaugural post, and we're kicking it on a cloudy day by a bright yellow taco truck. This place just smells delicious. 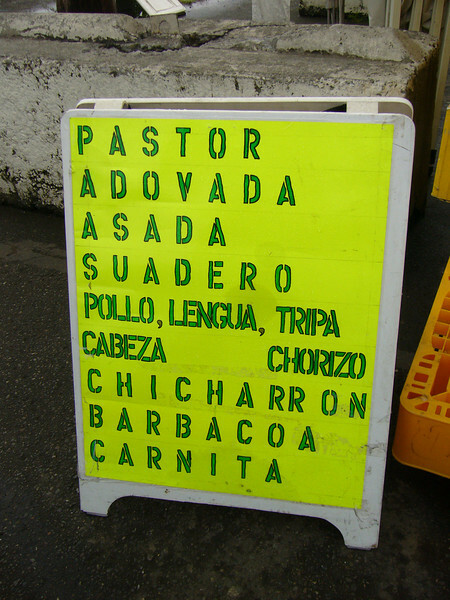 I went for four tacos - Pastor, Adovada, Suadero, Carnitas. The pastor was rad, little pieces of pineapple were chilling out in my taco. They claim on Friday evenings they set up the Pastor spit, and grill it up fresh and right. I'll need to come back to verify. Adovada was also quite savory. Suadero was tender rib meet and delicious. The only fail was the Carnitas, which were a little dry, but still perfectly grubworthy. Y'all may think you've had the world's best tacos (myself included). I don't think these will win any awards, but I'll be honest - these are done right, and worth a visit. let me get this over with: heineken? eff that ess. the first PBR150 run meets immediate setbacks. fallback: a taco truck sandwiched between by-the-hour hotels and pipe-testing facilities. inauspicious! brief aside: i don't know what the PBR150 core ruling is going to be on taking travel time into account; it seems a little unfair, like blaming a restaurant for being in spain or something, so in general i think i'll discount travel, except to mention: emmett really wanted to beat that train. 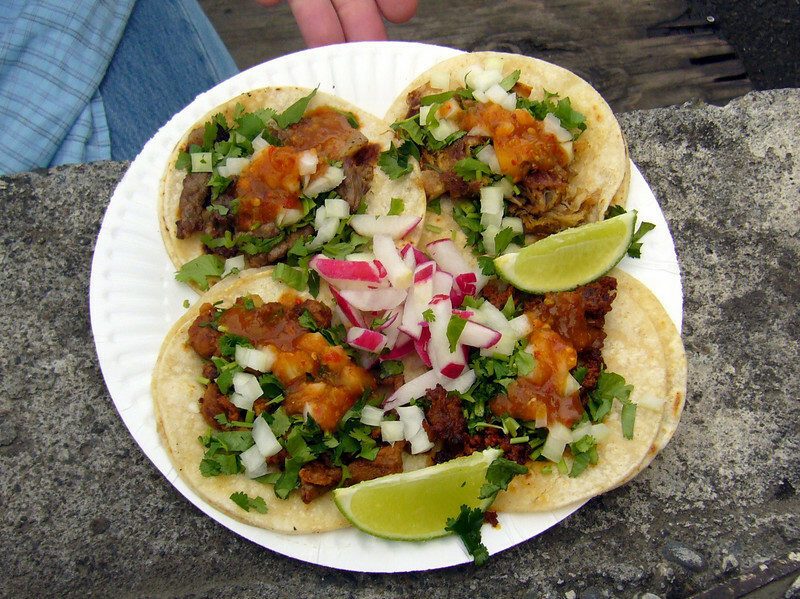 the tacos look like what i see on the tv shows of people who i wish i were, eating street food in places i wish i were. a little pile of various meats, cilantro, diced onion and radish, lime wedges, and the telltale orange of jabanero salsa. picking bits of meat off, i rate: the beef options are beefy, and maybe a little dry; the al pastor is sweet and delicious; and the chorizo is rich and spicy. eating the tacos, i rate: yeah. the beef options are merely wonderful; the richness of the suadero gives it a little leg over its peer. the al pastor is still sweet and delicious, and the chorizo might be better still; i'll need a few dozen more of each to be sure. i can truthfully say i've never had better tacos squatting next to a non-jersey barrier. heck, i've never had better tacos squatting in a fancy restaurant. the thing is, on that day, when i popped the last bite of chorizo taco into my mouth, i had never had better tacos. this was 4+ Rainiers for the food, but on that day, this was what 5 Rainiers is for. Welcome to PBR150. Our mission is to eat lunch at every establishment in Seattle's Georgetown neighborhood that will admit us and document our experience here. See our kick-off post. What the hell are we doing now?